, son of the preceding, was born at Pontamousson, Jan. 28, 1582. He was educated at the college of the Jesuits in his native place, and when only nineteen years old, published notes on the Thebais of Statins. The Jesuits, as already noticed in his father’s life, remarked his genius for literature, and attempted to win. him to their order, but his father looked on that attempt as a breach of trust. Hence there arose a quarrel between him and the Jesuits, who at that time were in high credit with the duke of Lorraine. He therefore quitted Lorraine in disgust, and conducted his son to London. This was in 1603, just after the accession of his native sovereign to the English throne. 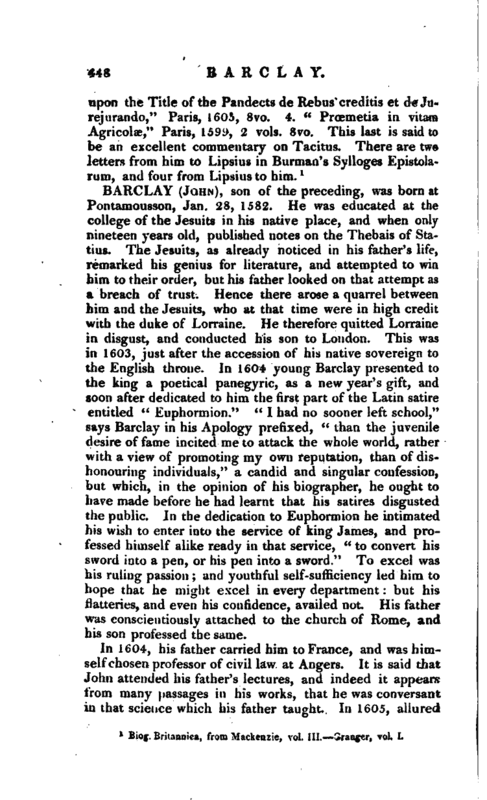 In 1604 young Barclay presented to the king a poetical panegyric, as a new year’s gift, and soon after dedicated to him the first part of the Latin satire entitled “Euphormion.” “I had no sooner left school,” says Barclay in his Apology prefixed, “than the juvenile desire of fame incited me to attack the whole world, rather with a view of promoting my own reputation, than of dishonouring individuals,” a candid and singular confession, but which, in the opinion of his biographer, he ought to have made before he had learnt that his satires disgusted the public. In the dedication to Euphormion he intimated his wish to enter into the service of king James, and professed himself alike ready in that service, “to convert his sword into a pen, or his pen into a sword.” To excel was his ruling passion and youthful self-sufficiency led him to hope that he might, excel in every department but his flatteries, and even his confidence, availed not. His father was conscientiously attached to the church of Rome, and his son professed the same. In 1604, his father carried him to France, and was himself chosen professor of civil law at Angers. It is said that John attended his father’s lectures, and indeed it appears from many passages in his works, that he was conversant in that science which his father taught. In 1605, allured | by some proffers of countenance and advancement, the sou returned to England, and remained there about a year. On his father’s death in 1606, he went to Paris, married Louisa Debonnaire, and soon after settled with his family in London. There he published the second part of his “Euphormion,” dedicated to that able and unpopular minister, the earl of Salisbury, in a style of gross flattery. 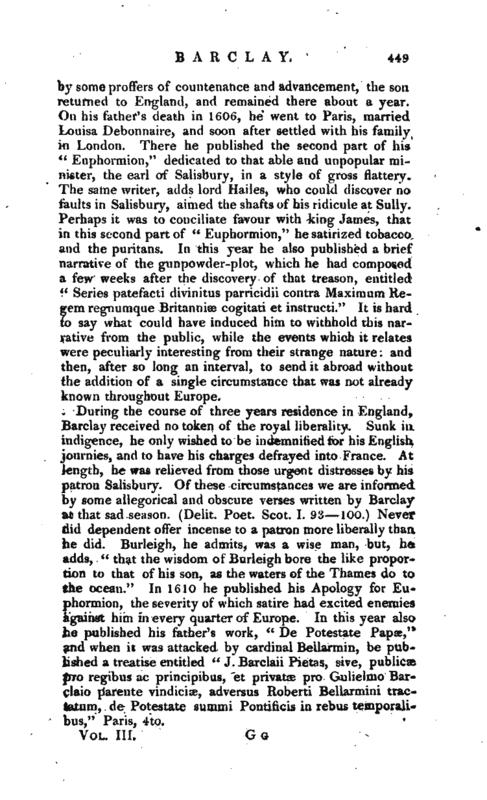 The same writer, adds lord Haiies, who could discover no faults in Salisbury, aimed the shafts of his ridicule at Sully. Perhaps it was to conciliate favour with king James, that in this second part of “Euphormion,” he satirized tobacco and the puritans. In this year he also published a brief narrative of the gunpowder-plot, which he had composed a few weeks after the dfscovery of that treason, entitled “Series patefacti divinitus parricidii contra Maximum Regem regnumque Britanniae cogitati et instructi.” It is hard to say what could have induced him to withhold this narrative from the public, while the events which it relates were peculiarly interesting from their strange nature: and then, after so long an interval, to send it abroad without the addition of a single circumstance that was not already known throughout Europe. During the course of three years residence in England, Barclay received no token of the royal liberality. Sunk in indigence, he only wished to be indemnified for his English journies, and to have his charges defrayed into France. At length, he was relieved from those urgent distresses by his patron Salisbury. Of these circumstances we are informed by some allegorical and obscure verses written by Barclay at that sad season. (Delit. Poet. Scot. I. 92 100.) Never did dependent offer incense to a patron more liberally than he did. Burleigh, he admits, was a wise man, but, he adds, “that the wisdom of Burleigh bore the like proportion to that of his son, as the waters of the Thames do to the ocean.” In 1610 he published his Apology for Euphormion, the severity of which satire had excited enemies against him in every quarter of Europe. In this year also he, published his father’s work, “De Potestate Papse,” and when it was attacked by cardinal Bellarmin, be published a treatise entitled “J. Barclaii Pietas, sive, publics pro regibus ac principibus, et privates pro Gulielmo Earclaio parente vindici*, adversus Roberti Bellarmini tractatum, de Potestate summi Pontificis ia rebus temporal!­bus,” Paris, 4to. | In 1614 he published his “Icon animarum,” perhaps the best, although not the most renowned of his compositions. It is a delineation of the genius and manners of the European nations, with remarks, moral and philosophical, on the various tempers of men. 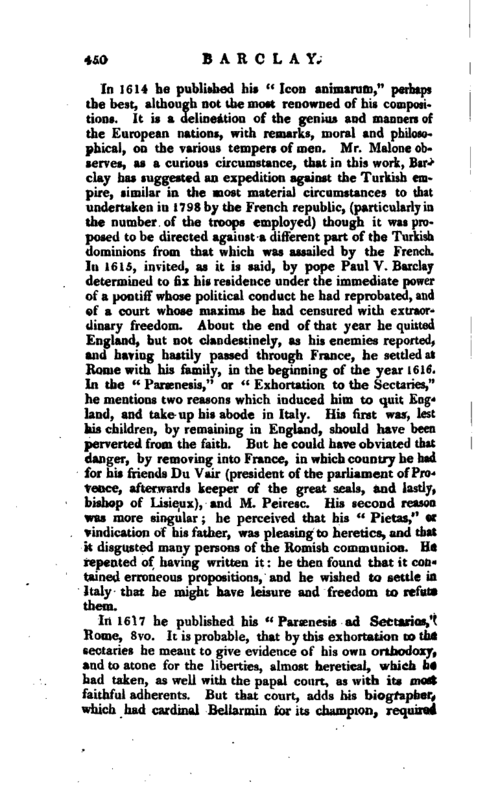 Mr. Malone observes, as a curious circumstance, that in this work, Barclay has suggested an expedition against the Turkish empire, similar in the most material circumstances to that undertaken in 1798 by the French republic, (particularly in the number of the troops employed) though it was proposed to be directed against a different part of the Turkish dominions from that which was assailed by the French, In 1615, invited, as it is said, by pope Paul V. Barclay determined to fix his residence under the immediate power of a pontiff whose political conduct he had reprobated, and of a court whose maxims he had censured with extraordinary freedom. About the end of that year he quitted England, but not clandestinely, as his enemies reported, and having hastily passed through France, he settled at Rome with his family, in the beginning of the year 1616. In the “Paraenesis,” or “Exhortation to the Sectaries,” he mentions two reasons which induced him to quit England, and take up his abode in Italy. His first was, lest his children, by remaining in England, should have been perverted from the faith. But he could have obviated that danger, by removing into France, in which country he had for his friends Du Vair (president of the parliament of Provence, afterwards keeper of the great seals, and lastly, bishop of Lisieux), and M. Peiresc. His second reason was more singular he perceived that his “Pietas,” or vindication of his father, was pleasing to heretics, and that it disgusted many persons of the Romish communion. He repented of having written it: he then found that it contained erroneous propositions, and he wished to settle in Italy that he might have leisure and freedom to refute them. In 1617 he published his “Parsenesis ad Sectarios,” Rome, 8vo. It is probable, that by this exhortation to the sectaries he meant to give evidence of his own orthodoxy, and to atone for the liberties, almost heretical, which he had taken, as well with the papal court, as with its most faithful adherents. But that court, adds his biographer, which had cardinal Bellarmin for its champion, required | not the feeble and suspicious aid of the author of Euphonnion. Although Barclay found much civility at Rome, yet it does not appear that he obtained any emolument. Inctimbered with a wife and family, and having a spirit above his fortune, he was left at full leisure to pursue his literary studies. It was at that time that he composed his Latin romance, called “Argenis.” He employed his vacant hours in the cultivating of a flower-garden. 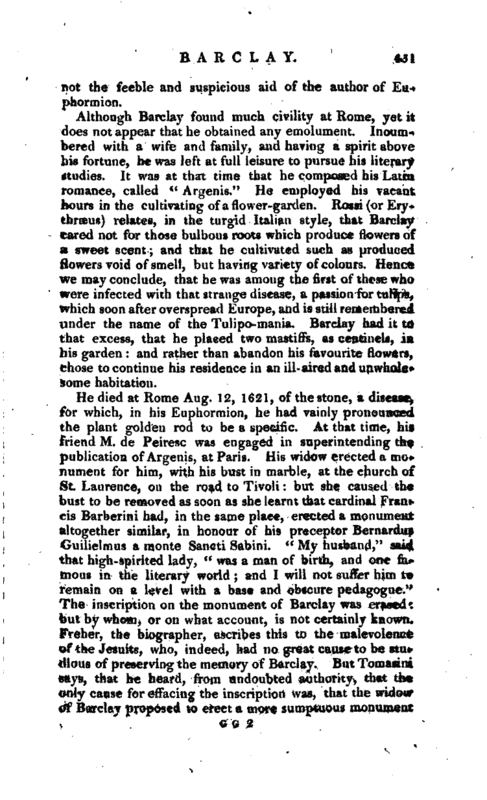 Rossi (or Erythrsfeus) relates, in the turgid Italian style, that Barclay cared not for those bulbous roots which produce flowers of a sweet scent; and that he cultivated such as produced flowers void of smell, but having variety 6f colours. Hence we may conclude, that he was among the first of these who were infected with that strange disease, a passion for tulips, which soon after overspread Europe, and is still remembered under the name of the Tulipo-mania. Barclay had it to that excess, that he placed two mastiffs, as centinels, in his garden and rather than abandon his favourite flowers, chose to continue his residence in an ill- aired and unwholesome habitation. The first edition of the Argenis was printed at Paris in 8vo, in 1621. It has since passed through many editions, and been translated into several languages. The first English translation was published in 4to, by Kingsmill Long, gent, in 1625, 4to. The poetical part was translated by Thomas May, esq. The second edition was published in 1636. There was also an edition in 1628, by sir Robert Le Grys, said to be by command of king Charles I. Another translation appeared in 1772, in 4 vols. 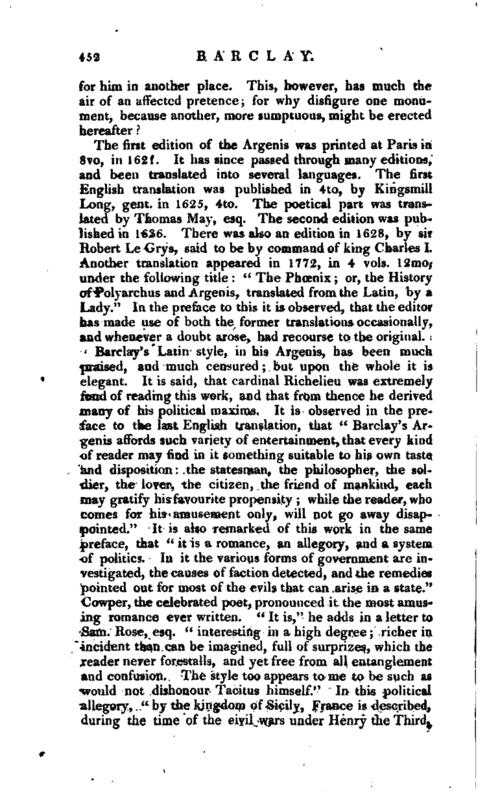 12 mo, under the following title “The Phoenix or, the History of Polyarchus and Argenis, translated from the Latin, by a Lady.” In the preface to this it is observed, that the editor has made use of both the former translations occasionally, and whenever a doubt arose, had recourse to the original. 1 From an excellent life of Barclay, printed, but not published, b,y the late lord Hailes. Biog. Brit. Erythrsei Pinacotheca. Malone’s Dry den, vol. II. 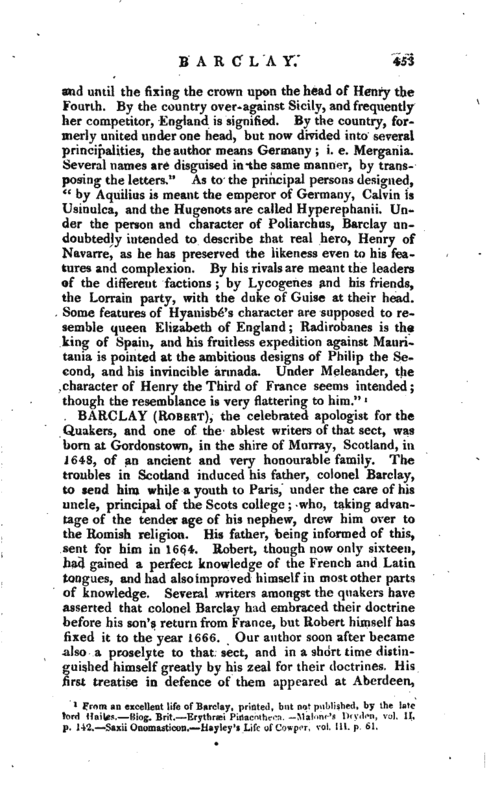 p. 142, —Saxii Onomasticon, Hayley’s Life of Cowper, vol. III. p. 61.